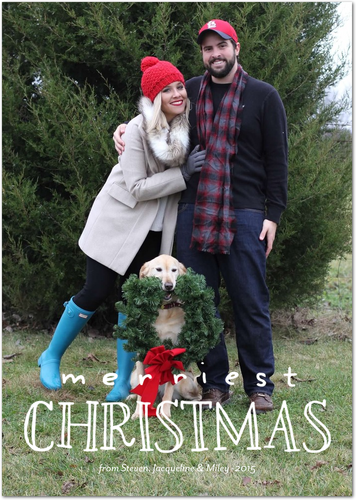 Our Christmas card this year! We took this photo before we got Zoe! Next year, she gets to join in on the family photo! You can see our past cards below! Love the card! You'll have to let me know how you got it to look so clear on the blog!! I would love to share mine on my site. I just love how your dog is holding the wreath! SO cute! OMG this is too cute!! I cannot believe Miley held the wreath. We've got some serious work to do on getting our dogs to be still for a pic. ;) Merry Christmas!! Such a beautiful Christmas card. I love that smart Miley is holding that pretty wreath. A little glimpse into our home this holiday season!